My daughter loves to save her money. She counts it, stacks it, records it and thinks about what she can get with it. For her, she often doesn’t get much further than thinking about spending her money. My son, however, has absolutely no trouble spending his money. But he’s getting better about it. An allowance can be a hot topic. We are pro-allowance. If you start giving one, you’ll need to decide what payment structure works for you and your family: chore based, flat amount, age based or some combination. By giving an allowance, the children have money to manage. We started fairly young (kindergarten) and do an age-based amount, so the amount of money they have to manage increases with age and, hopefully, with more responsibility. Even before the kids received an allowance, we got them each a special piggy bank. A similar option that is popular is the Moonjar. What we like about these are the separate goals: save, spend, donate, and one also has an invest area. Each week when we give allowance, the kids need to put some of their allowance into the ‘save’ portion of the piggy bank. We then encourage some money go into ‘donate’ and the rest they can spend as they wanted, within reason. For example we’ll allow them to buy some candy, but no chocolate covered espresso beans. We try to encourage a savings goal with the kids. This would mean we sometimes helped them choose good things to save up for with their money. They would often choose a big Lego set or a game. Sometimes, if they couldn’t come up with a goal, we’d take the savings and put it into their passport savings account at the bank for them to use when they are older. The donate portion of the piggy bank is tallied toward the end of the year. The kids have fun choosing a charity their money will go towards. In the past they have chosen the local animal shelter, farming support in poverty stricken nations, and emergency relief funds. We then match their donation, stretching their charity even further. When the kids were babies we opened savings accounts for them at a local credit union. This enabled us to put extra gift money for them into an account rather than it mixing with our money and getting forgotten. They also have the opportunity to go into the bank with their saved allowance and experience depositing their own money rather than mom or dad taking it and doing “something” with it. Every quarter when their bank statements arrive, we show them how much is in their account. Remember how I said my son has trouble saving? With the advent of middle school, he wanted a phone. Not just any phone, a smartphone. Of course. Well, we didn’t get him a smartphone. He’s too young to need one and constantly drops or loses things. We did spend a whopping $15 on a flip phone and the first 60 minutes of a pay-as-you-go plan as one of his birthday presents. Since then, he has been responsible for saving up his allowance to buy additional minutes and, yes, the eventual replacement phone because he lost the first one. Thankfully, that has worked out well. He did manage to learn how to save up money for a phone card. After he buys a new minutes card, he starts saving for the next one. As your children get older, you can show them how to be a better shopper. Our kids often like to get gum or mints with their spending money. When they were younger they would ask how much stuff cost. I would have them try to find the price posted. For gum, I then ask “Well, the 3-pack is $2.24 and a single pack is 99 cents. Which do you want?” This forces them to think about their purchase. Do they want 3 of the same flavor? Do they only want 1 pack, or a few different flavors even if it costs more? You can also compare prices among brands deciding to maybe try the store brand to see if you like it as well or better than the more expensive name brand. Or, I’ll often show the kids how much jarred spices are vs. the spices in the bulk bin or even from the local spice shop. Teaching kids how to manage money is important to prepare them for the future. It is also important to be able to model good money management. 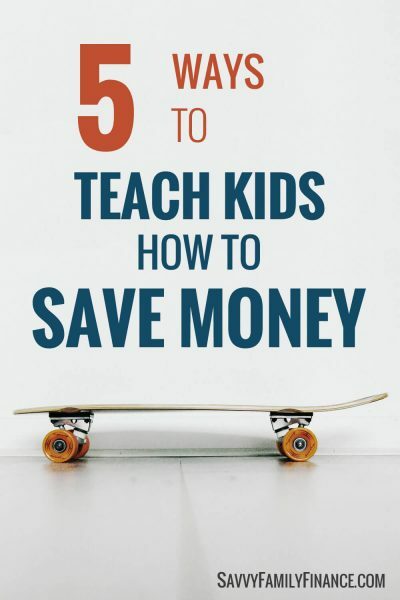 In fact, if you want to teach your child how to save money, modeling the behavior is probably the best way for them to learn. And they will learn to save and manage their money wisely…even if it takes a while to sink in. What methods have you used to teach your child how to save money? When my parents opened my first joint checking account, it came with a Banker Bear and a set of play money to help keep track of my account blance. In hindsight, I think it ended up being a great way to understand the connection of virtual money in the bank to real money.